I was going to write my ideas on best hiking gear but quickly realised it would be more interesting to write about my favourite hiking gear instead. Like every bushwalker, I need the staple items such as a tent, pack, sleeping bag etc and in my case have used many different types. But what are the items that have uniquely added to my experiences over the years? 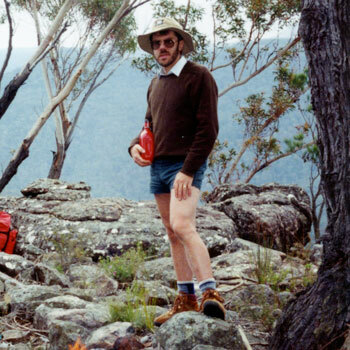 Perhaps a little quirky, below is a list of my favourite pieces of hiking gear. 1. My Hat - RIP. 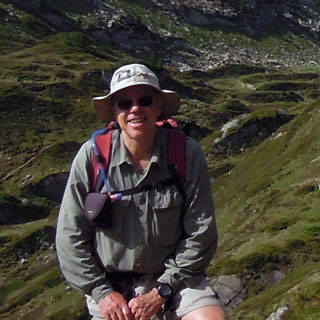 I am deep in mourning because a faithful companion that has accompanied me on every trip in the mountains for over 20 years went missing on a trip to Austria last year. My hat. An Outdoor Research Sonora Sombrero to be precise and its broad brim sheltered me from sun, rain and snow with never a cross word or complaint. Being synthetic the hat dried quickly, was easily washed and was able to shed a brief shower of rain. More importantly it seemed to have this strange ability to stick to my head like glue in windy weather. Over the years my hat got increasingly faded and battered (a bit like me); I had to take to it with a sewing machine a number of times to hold it together. We had been on so many adventures together. The modern day equivalent is the Outdoor Research Helios but it will never be the same as MY HAT. I first decided to get myself a wrist altimeter for the simple reason that to sell it you need to use it. At that stage back in 2002 this was a new fangled electronic device that I doubted would be very useful. Well how wrong I was. My Suunto Vector is one of the first items packed for any outdoor trip and is still going strong after 12 years. I walk predominately in mountain country and the perennial question is always how far is it to the top of the hill. In fact the Vector quickly replaced my compass as my most useful navigation accessory after a map. As a side issue on longer trips the overnight pressure variations that the watch reads gives you an insight into approaching weather patterns. I remain sceptical of many electronic devices, and seldom walk with a GPS, but I cannot recommend a wrist altimeter too highly. The Suunto Vector is still available as well as other models from Suunto. Everyone knows comfortable footwear is essential for hiking. 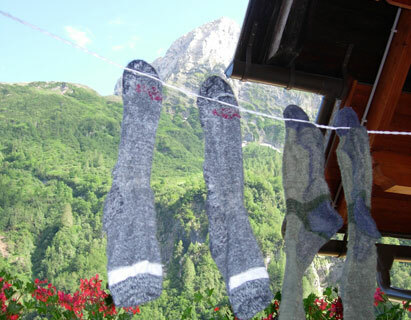 However an often overlooked item is that quality socks in good condition make an enormous difference to how happy your feet are. This was clearly highlighted to me on my 100 day walk through the European Alps in 2006. Packing the minimum of clothing the one “luxury” item I took was three pairs of socks instead of two. I deliberately took three different brands with me. After walking for a month or so it occurred to me that I had a strong preference for my Bridgedale Summit socks and I was choosing them to wear at every opportunity even if they were not quite dry. The Bridgedales were soft and very foot friendly. One other pair just did not cut it on the long 10 hour days we were doing. So much so that I threw them away and purchased an alternate pair in a village I was passing through. When I started hiking back in the 1970’s the de rigueur rain jacket was the trusty old oiled japara. This was a finely woven cotton (yes cotton) jacket impregnated with oil in the hope that the water would run off like on a duck. It worked fine when the jacket was brand new but required constant maintenance and leak points were inevitable. Next came the “revolutionary” Cagjac, a strong coated nylon jacket made by legendary Scottish firm G&H. This was completely impervious to the weather and bushwalkers rejoiced, but zero breathability meant you got nearly as wet from the inside as the outside. 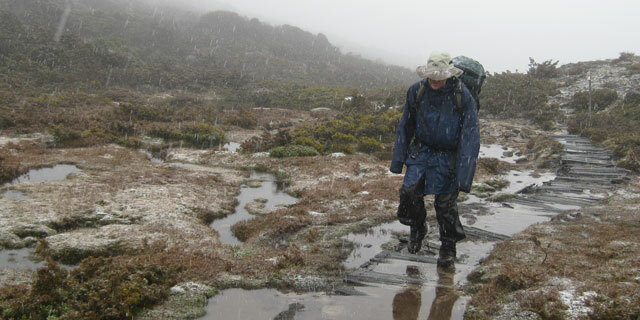 Fast forward and I now use a Mont Tempest rainjacket for hiking in wet places such as Tasmania and New Zealand. It is not a light jacket but is beautifully designed for hiking in prolonged wet weather. An excellent hood and long cut mean that it is like having your own little private oasis in the storm. Many is the time I have worn this jacket marvelling at how comfortable I am in hostile conditions. Mont’s Hydronaute Pro fabric works a treat. The only maintenance is to top up the DWR finish every couple of years. See Tips- Maintenance of Rainjackets. Over the last 10 years I have been introduced to the wonders of having a tarp in the party. One tarp in a party of four adds to the comfort of a trip immeasurably and the extra weight when split by a group of that size is minimal. 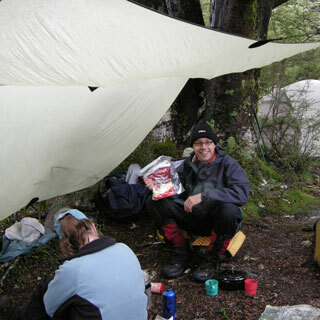 I have a Wilderness Equipment 3 x 3 metre tarp. It can be strung between two closely pitched tents to provide a sheltered cooking area or set up by itself to give an area out of the rain for the evening meal. At times it has even been pitched at lunch time so a break can be had out of the rain. Walking poles are handy for supports, it can be strung between trees and random sticks can also be used for supports. 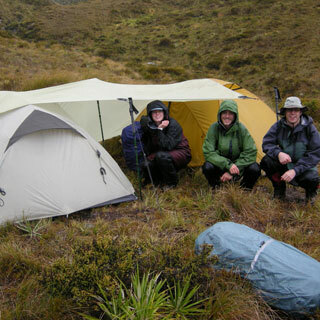 On a recent 8 day hike in New Zealand it rained at some stage on each of the first seven days. Problem? Not with our trusty tarp. What are your favourite items of hiking gear? Let us know in the comments below!